Cognitive Biology: Dealing with Information from Bacteria to Minds - Jon Lieff, M.D. 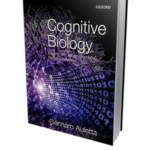 Professor Gennaro Auletta synthesizes neuroscience, cognitive science, philosophy, quantum mechanics, information theory and more in an elaborate study of how the brain functions, and what it has to do with information in the universe. This 800-page book filled with basic science is a tremendous resource in understanding perception, and brain function.